This research comes ahead of Bowel Cancer Awareness Month in April. Every year in the UK over 2,500 under-50s are diagnosed with bowel cancer, a 45% increase since 2004. Across all ages 13,000 people are diagnosed with inflammatory bowel disease, of which many are under 50, and both of these diagnoses are increasing worldwide, including in the UK. Symptoms of these conditions are common and account for one in 12 GP appointments, but given that most of the symptoms won’t be caused by cancer, it can be difficult for GPs to determine which patients need further tests. As a consequence young people often face a delay in their diagnosis, reducing their chance of survival significantly. Nearly 98% of people will survive bowel cancer for five years or more if detected at stage 1 compared with less than one in ten people diagnosed at stage 4. In addition, Bowel Cancer UK research shows that nationally, 3 out of 5 people diagnosed under the age of 50 will be at stages 3 or 4, with a third (34%) being diagnosed in an emergency situation, for example in A&E. This means that many younger people have a lower chance of survival than they should. 3 per cent risk or more: The GP should refer the patient for an urgent colonoscopy (a test to examine the inside of the bowel) or refer the patient to a specialist for further assessment. 1-3 per cent risk: The GP should recommend the patient for a faecal calprotectin test (which shows if there is any inflammation in the bowel). This can help rule out a non-serious condition like Irritable bowel syndrome (IBS). Less than 1 per cent risk: The GP should monitor the patient’s progress, but at this stage no further tests are needed. Deborah Alsina MBE, Chief Executive, Bowel Cancer UK, says: “As the numbers of under-50s affected by bowel cancer and bowel disease continues to rise, research is fundamental in finding better ways to diagnose people early when treatment is likely to be more successful. “We launched our flagship Never Too Young campaign in 2013 to highlight the experiences of young people for the first time and to improve their diagnosis, treatment and care so that more lives are saved. 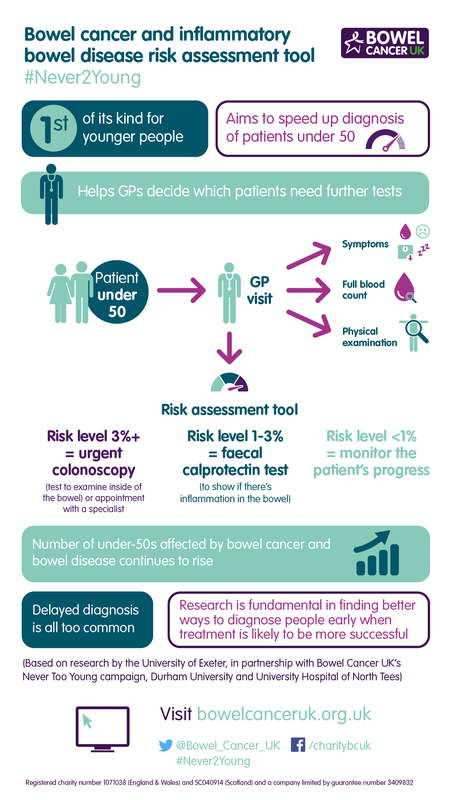 Delayed diagnosis is all too common for young patients with both bowel cancer and inflammatory bowel disease therefore finding quicker, more effective ways to identify and diagnose these patients earlier is crucial. Our research shows that one in five young patients have to visit their GP five times or more before they get their diagnosis and this is simply not acceptable. Deborah James, 35 from South-West London shares her story: “Despite being reassured by my GP on numerous occasions that I must have IBS, haemorrhoids or worse case colitis, my blood tests and stool sample came back ‘normal’ so everything must be fine. And yet I was still losing weight, passing blood, going to the loo what felt like 100 times per day and feeling shattered. I knew there was something wrong with me, a sixth sense if you will.